Hello again! 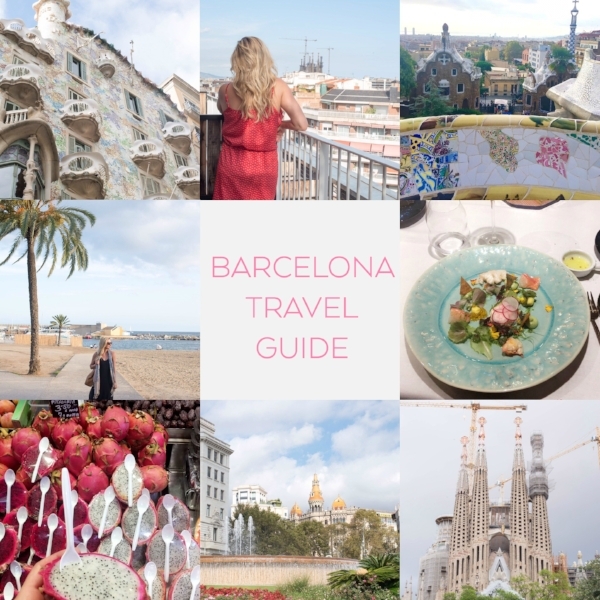 I'm back on the blog again today to talk more about Barcelona (if you didn't see yesterday's post on where to stay, be sure to check it out for another tool to help you plan your trip). One of the most popular questions I'm asked when people are planning a trip (besides what to pack) is where they should eat, and Barcelona certainly has NO shortage of delicious food to try. In fact, food is taken very seriously in Barcelona. Here are the basics you need to know. Catalan cuisine (which is the local fare) is an ancient Mediterranean style of cooking that's characterized by the aromas of the herbs that can be found on the mountains in the area. Most locals start their day with something light (like a cafeé con leche and a croissant). Meal times are much later than what we're typically used to in the US (lunch is usually around 2 or 3 while dinner is usually around 9 or 10). Of course, you can eat sooner if you prefer, but be mindful that some restaurants won't be open until a bit later. If you need to tie yourself over in between meals, go for some tapas, which is the quintessential Spanish food. Traditional taps items include papas bravas, manchego, calamari, chorizo, cured jamon and lots of other small plates you can nibble on in social settings. Try as many as you can! While in Barcelona, you should definitely try some Paella- a very popular rice dish that's served with fresh caught seafood in the area. Having a sweet tooth after your meal? Be sure to try some Flan: a traditional (and delicious) Spanish dessert. What about wine? Wine is present in almost all Spanish meals (my kind of people). If you're craving some bubbly, be sure to try Cava (which is the Spanish sparkling wine). There are also excellent red and white varieties local to the region (I prefer a good Spanish Tempernillo). I made a brief mention in reference to the paella, but be sure to eat some of the delicious seafood cuisine that Barcelona offers (especially at some of the restaurants that are on the water). While leaving a tip isn't expected in most restaurants, it's still appreciated (especially when the experience is memorable). Generally speaking, 5-10% is seen as generous should you choose to leave anything at all. So now that you have a general idea of what to expect, it's time to pick where you want to eat! Barcelona has SO many fantastic places, I can't even begin to scratch the surface on here. But assuming you'll only be visiting for a few days, I've pulled together my top picks to prioritize during your stay. We went to Spoonik for dinner, although it could more accurately be described as an incredible show + culinary experience. It was seriously one of the coolest and most memorable meals of my life. Be warned (in the best way) this is no ordinary restaurant. For starters, there is only one seating per night (and reservations go fast so be sure to make one far in advance before your trip). You'll think that everything is going to be somewhat normal as you sit with the cava they hand you and nibble on your first taste from the chef. Then suddenly, the lights dim. Music starts playing. The chef passionately begins telling the story of the food he's prepared while the rest of the kitchen staff sporadically chimes in energetically all at once to give his story even more pizazz. Most places casually hand you the dish you order when your meal is served. But Spoonik taught me it's WAY more fun when 10+ men shout "AVOCADO!" and clap in unison. The food is insanely delicious. The wine pairings compliment every dish perfectly. The show and tell of the entire production will leave you dazzled, well-fed and so thankful for the experience. While Spoonik isn't the cheapest option in Barcelona, I'd argue it's without a doubt the most unique and unforgettable. Skip a proper "sit down" lunch for a couple days and just snack at Boqueria if you need to justify the cost, but whatever you do- don't miss the experience. Sitting at La Gavina, nestled in Port Vell, is one of the most scenic views you can take in during a meal in Barcelona. I came here with my family on the first trip I took, and I added it to the list of places Sarah and I had to go back this time because I loved it so much. The food is incredibly delicious (we shared paella and their fresh catch of the day). But what has stuck with me (both times that I've gone) is drinking a bottle of wine and watching the sun go down over the Mediterranean and all the yachts in the port. This historic restaurant opened in 1897 and just 2 years later at age 17, Picasso started to become a regular. He even carried out his first exhibition there (the poster he used to promote it is now the title page of their menu). But Picasso isn't the only great artist to make 4 Gats unique. Barcelona's great architect Gaudi, musicians like Isaac Albéniz, Enric Granados and Lluís Millet were all customers. Today the history remains preserved and the menu can stand on it's own- serving premium Catalonian food + tapas that will leave you delighted. We stumbled upon Pez Vela when we were strolling along Barcelona Beach near Port Olímpic looking for someplace to have a drink. The atmosphere here was fantastic- right on the water. They offer a new version of the typical seafood restaurant you'll find on the shoreline (along with some amazing cocktails). Sit by the water, order some sangria and watch the sun go down over the Mediterranean. Hopefully this helps you decide where to eat in Barcelona! Where else do you love to eat in this city? I always love new ideas + recommendations to try out the next time I'm back!